2019 week 2, 11.9 mbpd. Good, 3 mbpd increase in just two years. Trump is doing his job to bring down world oil prices by expanding US oil production, de-bureaucratizing oil-gas exploration and extraction. But OPEC + Russia are doing the opposite, raising world oil prices by cutting their combined oil output. Their last deal is to cut output by 1.2 mbpd starting this January 2019. "The agency reported U.S. oil production is expected to rise by 1.3 million barrels a day in 2019. While this number is lower than the record-smashing 2.1 million increase producers enjoyed in 2018, it’s more than double what the IEA initially expected to see in 2019." 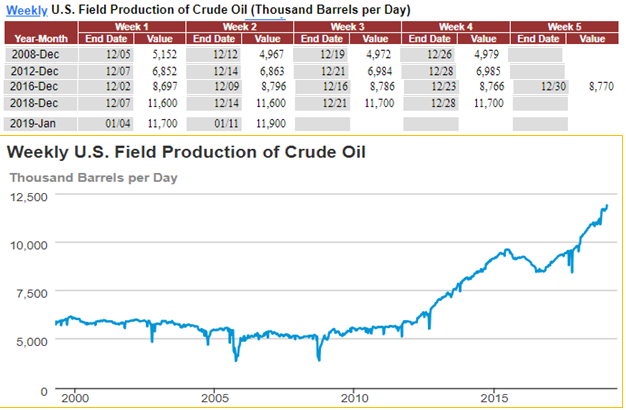 "The Department of Energy forecasts U.S. oil production will jump from 10.9 million barrels per day in 2018 to 12.9 million bpd in 2020. The same year, the nation will start exporting more crude oil and fuel than it imports, the agency says." I think it will be higher. Early 2019 the US is already producing 11.9 mbpd, the 12.9 mbpd could be reached by December 2019. So by end-2020 it might reach 13.5 to 14 mbpd. Cheap oil is necessary for the world, both developed and developing countries. Agriculture now is becoming more mechanized, the machines and tractors use lots of oil; farmers in the Philippines and other developing countries now ride motorcycles if not 2nd-hand cars, which again use lots of oil.